The Nielsen company said Tuesday that viewership for the show’s premiere shot up to 25 million people when delayed viewing for the three days after last Tuesday’s first showing is added. The increase of 6.6 million people sets a record for the biggest lift ever for a show in the three days after a premiere, Nielsen said. A lot of programs would be happy to get 6.6 million viewers, period. “Roseanne” was helped by the extent to which it became part of the cultural conversation once its first-night ratings of 18.45 million people were reported, likely drawing in others who were curious about the fuss. President Donald Trump even congratulated star Roseanne Barr for the success of the show, in which her character supports him politically. Discussion of the unusually strong “Roseanne” ratings tended to overshadow CBS’ ratings for “60 Minutes” two days earlier, where an interview with adult film star Stormy Daniels about her alleged affair with Trump before he became president reached 22.1 million viewers. Trump has denied her story. Unlike “Roseanne,” people weren’t likely to watch the Daniels interview if they didn’t see it live. Adding in people who watched during the three days after its initial airing, and the “60 Minutes” audience increased to just under 22.8 million. News programs generally have little delayed viewing compared to scripted entertainment, and the “60 Minutes” audience is among television’s oldest, and less accustomed to time shifting. The reach for these two programs was a fresh reminder that for all of the attention received by streaming services, there’s still no matching broadcast television’s ability to entice a large number of people to look up from their personal devices. On a more modest note this week, NBC’s “Jesus Christ Superstar Live” drew 9.6 million viewers for the network’s most watched Easter in a dozen years. CBS won the week in primetime, averaging 6.9 million viewers. ABC was second with 5.9 million viewers, NBC had 5.4 million, Fox had 2.6 million, Univision had 1.5 million, ION Television had 1.3 million, Telemundo had 1.1 million and the CW had 1 million. The NCAA men’s Final Four led TBS to the top of the cable news primetime rankings, with the network averaging 2.47 million viewers for the week. Fox News Channel had 2.03 million, MSNBC had 1.69 million, HGTV had 1.45 million and ESPN had 1.44 million. ABC’s “World News Tonight” topped the evening newscasts with an average of 8.6 million viewers. NBC’s “Nightly News” had 8.3 million and the “CBS Evening News” had 6.1 million. Below are primetime viewership numbers compiled by Nielsen for March 26-April 1. Listings include the week’s ranking and viewership. 1. 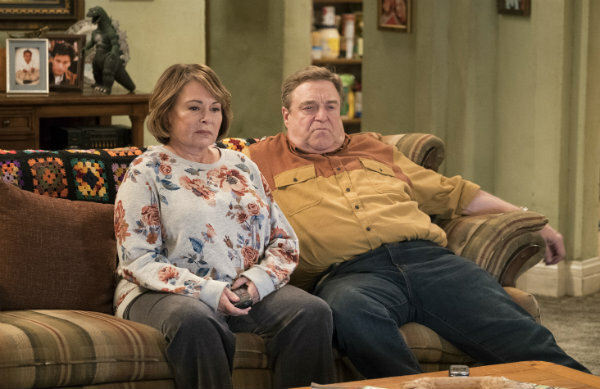 “Roseanne,” ABC, 18.45 million. 2. “The Big Bang Theory,” CBS, 13.27 million. 3. “NCIS,” CBS, 11.94 million. 4. “Young Sheldon,” CBS, 11.92 million. 5. NCAA Men’s Final Four: Loyola-Chicago vs. Michigan, TBS, 10.75 million. 6. NCAA Men’s Final Four: Kansas vs. Villanova, TBS, 10.7 million. 7. “Bull,” CBS, 10.65 million. 8. “The Voice” (Monday), NBC, 10.51 million. 9. NCAA Men’s Final Four: “Bridge Show,” TBS, 9.86 million. 10. “Jesus Christ Superstar Live,” NBC, 9.61 million. 11. “The Good Doctor,” ABC, 9.52 million. 12. “The Voice” (Tuesday), NBC, 9.02 million. 13. “Black-ish,” ABC, 8.59 million. 14. “Mom,” CBS, 8.56 million. 15. “NCIS: New Orleans,” CBS, 8.53 million. 16. “Blue Bloods,” CBS, 8.43 million. 17. “60 Minutes,” CBS, 8.33 million. 18. “Survivor,” CBS, 8.16 million. 19. “American Idol” (Monday), ABC, 7.81 million. 20. “Hawaii Five-0,” CBS, 7.8 million.